It is not difficult to find a kendo equipment shop in Japan. Besides, it is easy to go to a shop and see and touch their kendo products. It is not a hard task to do at all. I did not have any problems before I left Japan with getting kendo equipment. You may be surprised with the fact that many martial arts shop do not sell proper kendo equipment. Since not many people know what kendo equipment should look like, these martial equipment shops (online and offline) can sell non-kendo products as kendo equipment. I am not saying all the martial arts shops are selling fake kendo equipment but pointing out the possibility. How do I know if these martial arts shops are selling non-kendo equipment as kendo equipment? Good question. It is because I know many people who think are wearing or using kendo equipment but they are not. Who are many people? They are my students. They paid about the same amount on these so called “kendo equipment”, but not quite the same as kendo equipment. Or since these people do not know how to order kendo equipment, they bought wrong ones. If you want to spend money, you want to spend money on the RIGHT equipment, don’t you think? I had to find a good kendo equipment shop not only for me but also for my students. So I would like to share my experience and thoughts on choosing a good kendo supplier. * This is my personal experience. I am sure it is different to many of you. I ignored all the martial arts shops online. Why? Kendo is still rare martial arts. 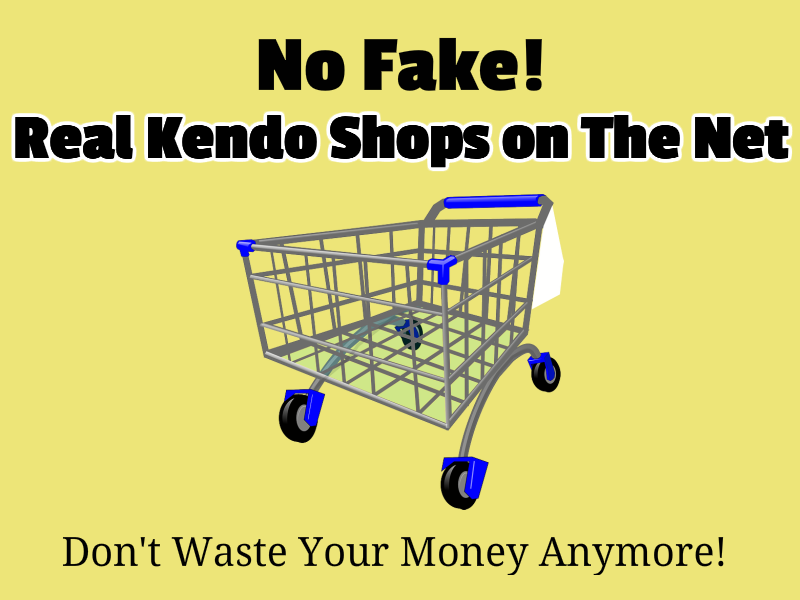 Even most of martial arts shops online do not know what they should be selling for kendo. If those who do kendo take a glace at those martial arts’ websites, they can tell whether or not those online shops know what they are selling .Most of the martial arts shops online don’t have a clue about what kendo equipment really is. I am sure some online martial arts shops sell right kendo equipment, but I don’t know which one. As of March 2009, I just cannot decide which online martial shops are selling genuine kendo equipment by looking at their websites. Go with shops that mainly deal with kendo stuff. When you find a kendo equipment shop online, find a page or pages that explain what length of shinai is appropriate for you, how to measure your amour size to buy the right armour for you and so on. Most of those online marital arts shops do not have these pages. If they do not have these pages to explain what to buy for your size, then don’t waste time and money on that shop. Unlike these online martial arts shops, kendo equipment suppliers have a page/pages to explain how to measure to order amour from them. It is not simple measurement of height and weight when ordering a set of armour. Just ask a simple question by phone like “which shinai (bamboo stick) should I buy?”. If they tell you something other than age, they don’t know anything about kendo. I think if you just want to buy a single or couple of items off a shop on the Internet, these mentioned above are things you should pay attention to. Now if you want to choose a kendo equipment shop that you want to deal with for a long time, then the next step is quite important. Personally, I think that these suppliers should have kendo attitudes, if they sell kendo equipment. I made some phone calls to kendo shops I found online. Some were very rude. Of course, I don’t tell them what grade I hold. I just want to see how they treat customers in general. Kendo does not teach rudeness at all. Having the same values and perspectives towards kendo is very important to me as well as the quality of products they sell. While talking, you can kind of figure out what kind of attitude they have towards kendo. I do not want to recommend anything I never tried. Why? It is because I do not want you to buy “fake” or “almost” kendo equipment. I did all my research and actually am dealing with one kendo equipment supplier. At the moment, I can only recommend this kendo shop. If I buy something from some different kendo shops and I can recommend them to you, I will add them here. I have been dealing with Maruyama Kendo Supply since January 2009. I wrote a review so it will help you to know what they sell. Unfortunately, Nine Circles USA is closed. Since 2011, I have been also dealing with Nine Circles USA. The president of the company is a very nice person and their service is very quick. For detailed review on their service and products, please go to Nine Circles USA review. Do you have a kendo equipment shop to recommend? Please go and check the list of kendo shops to see a shop you recommend is already there. If not scroll down the same page and recommend me a shop you like using a Kendo Shop Recommendation Form!